Work Rolls used in SS Cold Hot Rolling Mill, Aluminium Rolling Mill, Tube mill etc. Material EN-31 K310. Depending on the application and requirement of the customer, we offer different materials and hardness of the roll. To supply the ever rising needs of our customers, we are occupied in offering a wide range of Tube Mill Rolls. We are a famous iron rolls supplier in india. We provide a graphite iron roll which has high tensile strength. We offer spheroidal graphite iron rolls, graphite iron rolls and iron rolls at the most acceptable price. We manufacture premium quality Industrial Rolls in various sizes and finishes. Our rolls are fabricated from excellent raw materials which are characterized by durability and strength. The laminated rolls are widely used by the industry for making packaging solutions. These Rolls are made in sizes like 6, 8, 10 and 12 feet. With two Plate Bending Machines, plates upto 50 mm thick x 2500 mm width can be rolled. Thickness upto 150mm are rolled in Hydraulic Press by progressive forming technique. 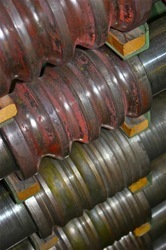 We manufacture a wide range of mill rolls 20 hi from fine quality steel. The size and diameter varies as per clients requirements. 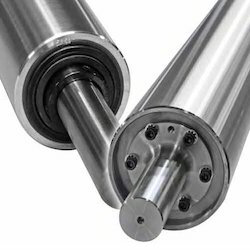 These rolls are mainly used in rolling milling machines. The working surface of Clear Chill Rolls shows the white graphite free structure consisting of eutectic carbide and transformed austentite. This gives a hard layer which confers good resistance to wear. The core and neck are made upon steel shaft in specialized double poured centrifugally cost chill rolls barrels. SMTL in association with its business associates is capable of offering high quality rolls such as work rolls, intermediary rolls and back up rolls used for various applications depending upon physical and chemical properties, etc. - Price may vary as per the size and material. - 25000 Rs. To 800000 Rs. Per Piece.